Why Stage a Gorgeous House? If you’re preparing to list your gorgeous house for sale and wonder, why stage it, you’re certainly not alone in your indecision. Many people who take pride in ownership believe that the value of their property is easily seen. Yet realtors listing million dollar properties continue to recommend professional staging. When we spend time living in a space, we grow emotionally attached to it. Not only does the property possess appealing features that we deeply appreciate, but we have dreams and form memories around those features which add to our perceived value. That’s why it’s easy to wonder, does staging work (and is it worth it)? The challenge, as a seller, is to understand that the potential buyer makes an impression within minutes, if not seconds, and it has nothing to do with the value you perceive. The focus in preparing your property for sale is on understanding what the potential buyer wants (and needs) and in delivering that experience as immediately as possible. Take this $1M+ property in Dewinton listed by one of my repeat realtor clients. It’s a gorgeous property on four acres located just ten minutes outside of Calgary. What’s not to love? It’s even got a sauna room! Still, the realtors hired me to provide a staging consultation on the property. Why? They know that there’s only one chance to make a first impression. And that first impression usually starts with photos. This example highlights the fact that, sometimes, your property doesn’t need much to prepare it to sell. But realtors know that little tweaks, with guidance from a professional stager, can create the tipping point that edges your property out against the competition. After: This office space feels organized and spacious – a great place to work. Check out the hidden room behind the shelf. 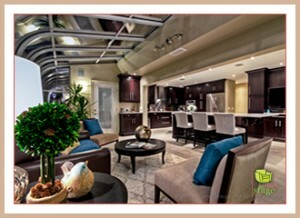 Why stage your gorgeous home? 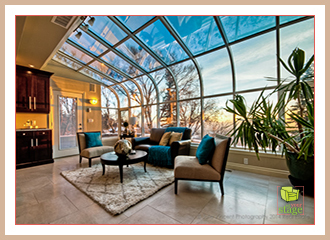 Find out how your Calgary property can benefit from professional staging and discuss the results Set Your Stage clients have achieved. 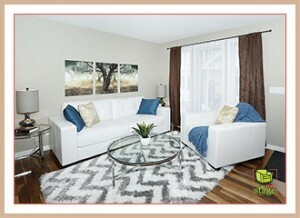 Schedule your personalized Home Staging Assessment by contacting Jen at Set Your Stage today. 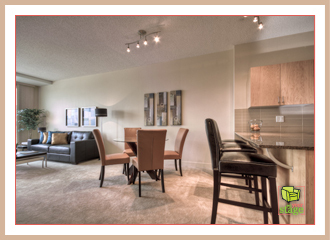 A small condo can feel masculine yet chic, classy, and spacious when it is staged with consistency in mind. Just take a look at this condo we staged in the SE Haysboro community in the London Towers. 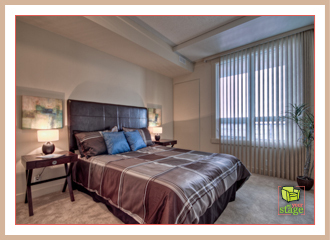 It was professionally staged with potential buyers’ ideal lifestyle in mind. Colour: We choose an appropriate colour scheme throughout the entire condo to unify the spaces. This provides a sense of flow which contributes to a feeling of spaciousness. After: There is plenty of space in this kitchen area for entertaining friends or family with seating also at the breakfast bar. Balance: The main living area is a prime example. The open concept living/dining/kitchen area is balanced in terms of light and dark. 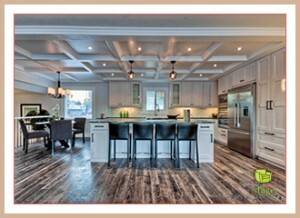 Dark furniture counteract the neutral light walls as well as maple kitchen cabinets and counters. A pop of bright accessories serves a similar purpose. After: This expanded open concept living & dining room is the perfect space for entertaining or relaxing. Materials: We picked up on the white appliances by adding black and white coffee/end tables and black furniture and lamps in the living room to create a consistent feel between the separate functional areas. By staging this small condo with consistency in mind, it prevents the space from feeling disjointed to potential buyers as they move through the property. By avoiding this jarring feeling, the space feels more open and spacious. For most buyers, that’s perceived as a selling point. Create your property’s best first impression with an inviting feeling that suits the potential buyer’s ideal lifestyle. 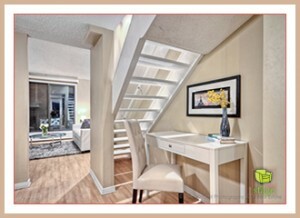 Even a small condo can stand out from the competition with proper staging. First impressions sell. That, ultimately, is why realtors hire stagers. Several realtors in Calgary have hired me multiple times for that very reason. They experience first-hand the difference a professionally staged property makes in the selling process and want to pass on that added value to their clients. It’s a win-win. There is list price. And then there is staged price. Realtors understand the difference and can quickly tell whether a property can benefit from staging. Whether it’s a consultation or a full staging with rental furniture, staging delivers one of the top returns on investment when preparing a property to sell. With so much on their plate for each listing, hiring a stager can help to lighten the load. Buying and selling can be a very personal experience with plenty of emotion involved. Sometimes realtors hire stagers to act as a third party to remove themselves from some of that emotion. For example, a stager can explain to the seller how the condition of their property may hinder the opportunity for a quicker sale. Depending on the property and the personalities involved, that might be a conversation the realtor would gladly avoid. Sometimes property owners can “hear” the message more clearly from a third party. 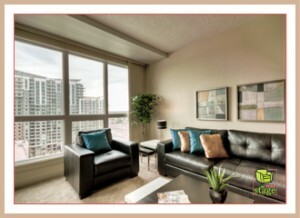 As the proud founder of the Calgary home staging company, Set Your Stage, my job is to help you and your clients get a property sold quickly and for top dollar. To find out if your clients’ properties could benefit from staging, to see if we would work well together, or for more information on my Preferred Pricing for Realtors contact Jen today. 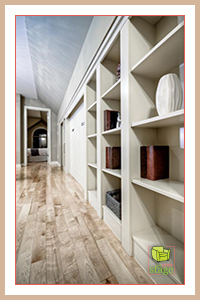 Did you know that an awkward space, especially if left empty, creates confusion for a potential buyer? That confusion can make a lasting negative impression. It’s as if there’s a missing piece of the puzzle to figure out. Complete the puzzle for them. Stage your awkward space to turn it into a selling point. Your property can be new, well kept, and quite lovely. But if you’re leaving an awkward space empty, hoping that the potential buyer will look at it as inspiration, I recommend you think twice. People like completion. Many potential buyers will have no idea what to do with an empty space. So it will either hold no value for them, or worse, be perceived as a potential problem. Avoid the confusion and create added value by professionally staging your awkward spaces before you list. We decided to create a comfortable seating area that feels like it fits with the kitchen. It’s an area where the potential buyer can imagine entertaining during food prep before dining and perhaps for drinks and dessert afterwards. The perception of value increases for the potential buyer. After: What a cute space home owners could fit their office space in. This empty space underneath the stairs was a perfect place to stage a small office area. Creating additional functional space in a property, especially for an office or study area, is always an added value for buyers. 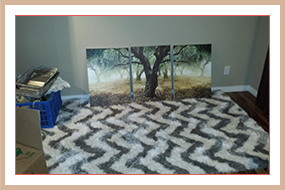 For more examples of the power and impact staging can create in a space, take a look at the Set Your Stage Facebook albums featuring many before and after photos of the various homes and condos that we’ve successfully staged for sale. You are currently browsing the Set Your Stage weblog archives for April, 2015.